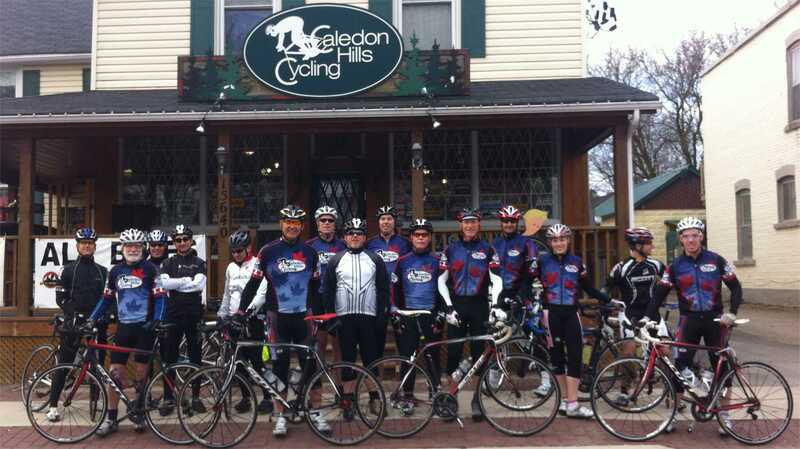 Club road rides start and finish at Caledon Hills Cycling (the bike shop) in Inglewood. Rides are open to Caledon Cycling Club members only. Caledon Cycling Club’s purpose is to promote bicycling. Parking is available in front of the shop, just south of the shop in the Caledon Trail Way parking lot – by the railway tracks – OR at the Lloyd Wilson Arena - further south. If you park at the arena, please fill the spaces closest to McLaughlin Rd. first. Sundays promptly at the following times: Sportif, Classic, GT, Easy Rollers and Beginners groups depart at 09:00. Departure time changes will be communicated well in advance. (Note: no club rides on long weekends). See the Calendar for departure times and proposed route. If you would like to participate in one of our rides, we would love to have you join the club. Please arrive early enough that you can complete the membership process prior to the departure time. If you are not ready to ride at the group departure time, the group will most likely leave without you. Tip! Completing the forms online, printing them and bringing them with you will save a considerable amount of time. WHICH LEVEL SHOULD I RIDE IN? Beginners (between 40 - 50 kilometres an an average pace of 19kph - a more social minded group. If you are unsure what level to start in, ride in Beginners. Distances and average speeds may change depending on routes chosen, group makeup etc., please use as a guideline only. Expect ride durations of up to 3 hours. Distances may increase as the season progresses. We will try to post ride routes on the club Calendar in advance - generally the Wednesday before the ride. Check the Calendar and subscribe to our Twitter feed to be sure you have access to up-to-date ride status. If weather forces a ride cancellation, we will Tweet the details and post an update to the News and Alerts page of the website. All riders must wear a CSA approved cycling helmet and carry at least one water bottle. It is strongly recommended that two water bottles be carried, especially during July and August. Two water bottles is mandatory when the forecast temperatures are 25 degrees or greater. Each rider is expected to be self-sufficient and carry: identification, food if required, at least 1 spare inner tube, tire levers and a pump or CO2 cartridge. Optional: cell phone. The ride leaders do not carry spares for your bike. Due to the pace and distances travelled, road bikes are required – hybrid or mountain bikes are not acceptable for club road rides. Any rider presenting themselves with unsound equipment on the day of a ride will not be allowed to participate. Any rider acting in an unsafe manner shall be removed from the ride at the discretion of the ride leader. Caledon Cycling Club riders shall follow the rules of the road at all times. If you are new to riding the road in a group, or even if you are a 'seasoned veteran', take a read through the how we ride page so you know what to expect and what is expected of you.